Register and provide Care, Support and Treatment services to all PLHIV and monitor patients in HIV care (Pre-ART) regularly. Indentify eligible PLHIV requiring ART and initiate them or ART in a timely manner as per the NACO guidelines. Provide ARV & OI drugs to eligible PLHIV. Provide treatment adherence and counseling services before and during treatment to ensure high levels of drugs adherence. Counsel and educate PLHIV, caregiver, guardians and family members on nutritional requirements, hygiene, positive living and also on measures to prevent further transmission of infection. Refer patients requiring specialized services (including admission) to other departments/higher facilities/CoE. Ultimately integrating HIV care into general health system for long term sustainability. On the basis of the HIV Sentinel Surveillance 2014-15 the epidemic of HIV /AIDS in J&K is static and under control. J&K State fall under the low Prevalence State where the ANC prevalence is 0.05%. There are 4791 clients registered at ART centers and 1030 AIDS deaths so far. Being a low prevalence state, the mission of J&K State AIDS Prevention and Control Society is to disseminate wholesome AIDS awareness to every citizen of the State especially living in the age group of 15 – 49 years. To provide ART to eligible PLHIV and counsel them on 100% adherence to therapy for long term effectiveness of ART. To monitor patients on ART and manage side-effects. To screen PLHIV for HIV-TB co-infection for early diagnosis of TB and appropriate linkage with the RNTCP. To refer patients suspected for drug toxicity and/or treatment failure to SACEP for review and initiation of alternative first line or second line ART. To provide psychological support to PLHIV accessing the ART centre and provide counseling for adherence to ARV drugs and issues related to toxicity and to educate PLHIV on proper nutrition and measures to prevent further transmission of infection. To encourage and help PLHIV to access various welfare schemes provided by different ministries/departments of government and accredited social entitlement schemes. The ART services are presently being rolled out through ART centres located mainly in medical colleges, tertiary hospital and district hospital. As the ART is a lifelong therapy and drugs are generally provided once in a month, the frequent visit leads to inconvenience, long travel distance and cost to the patient. Hence, in order to reduce the travel cost and travel time in accessing ART services, to increase the access to HIV care for the PLHIV, to improve the drug adherence of patients on ART and to bridge the gap between counseling & testing services and Care, Support and Treatment Services, it was decided to set up Link ART Centres at ICTC’s in the district/sub-district level hospitals/CHC’S nearer to the patients residence. These centres are linked to a Nodal ART Centre. To provide ARV drugs to pt. on ART, monitoring of pt. on ART, +/+ of minor OI’s, identification and management of side effects and reinforcement of drug adherence. 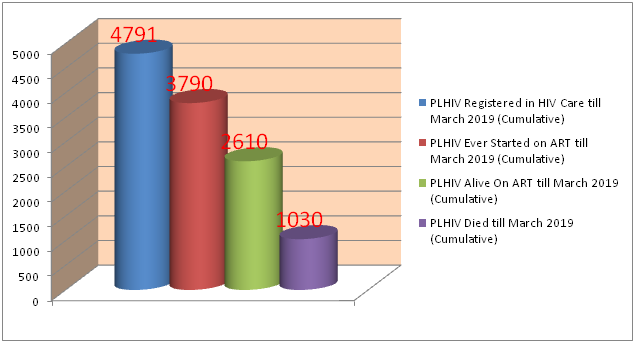 Monitoring of PLHIV on ART. Linkages with various services such as RNTCP, STI, DLN, other NGOs and CBOs etc. To provide psychological support to PLHIV accessing LAC. Provide information about the various social welfare schemes. J&K state has two fully functional ART centres in which 4791 patients are in HIV Care, 3790 patients ever started on ART and 2610 patients currently on ART. J&K state also has four fully functional LACs. A state Grievance Redressal Committee (SGRC) has been constituted, for addressing the grievances of HIV/AIDS patients. All routine investigations like HB/TLC/DLC/PBF/Blood Urea /Chest X-Ray etc. are done free of cost for PLHIVs at all the institutions where the ART centres are located. Second line treatment is also available in ART Plus Centre GMC Jammu. All these 2nd line ARVs are available in ART Plus Centre, GMC, Jammu. There are 153 PLHIV on 2nd line ART in ART Plus Centre (Till March 2019).